Evernote tip 7: Seeing the wood from the trees: unclutter the Evernote toolbar. 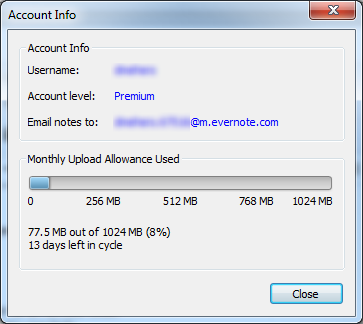 I’ve been using Evernote since November 2009, so you’d think I ‘d know how to use it by now. If you cheated and read the text you can probably saw it immediately, largely because it says “New Note” right next to it. But I was scanning the icons, and the “New Note” icon didn’t jump out at me. In fact my eyes were drawn to the one icon that screams “Add something” to me. Can you guess which one it is? (hint, the one with the big “+”). It turns out I only ever use the toolbar for two things: for syncing, and creating new notes. Everything else, such as sharing, I do by right-clicking on a note. My solution: If you right-click the toolbar, and select “Customize toolbar”, then you can drag all the items you never use off the toolbar. You can also take away the text labels. The icon still doesn’t say “Add Note” to me, but since I’ve only got a choice between that button and the sync button, I’m pleased to report I create new notes without hesitation. You can do this with both the Windows and Mac clients. This entry was posted in Evernote on September 20, 2012 by damian. This is the feature that I wish all Evernote users knew about. It adds so much power because it lets you to send stuff to Evernote from pretty much anywhere, from any app. Almost all apps support sending their content via email, and all Evernote users have a secret email address associated with their Evernote account. Anything sent to your secret Evernote account email address gets added created as a new note in your Evernote account. I’ve created a “toevernote” email contact with my secret Evernote account email address in my Email client. Whenever I’m reading something interesting on my iPad, I share it to email, and select “toevernote”. Within seconds, whatever I was reading pops up in my Evernote account. Try it out – its the best way to send content to your Evernote account from anywhere. 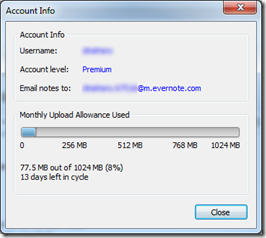 Next up: Seeing the wood from the trees: unclutter the Evernote toolbar.